Following the new EU directive banning battery cages in Ireland we have been able to save fifteen hens from unnecessary slaughter. The hens are doing well, apart from the fact that some of them have significant feather loss, and others are limping on sore feet. They are learning how to leave their new house in the mornings but most of them still need to be carried into bed at night. 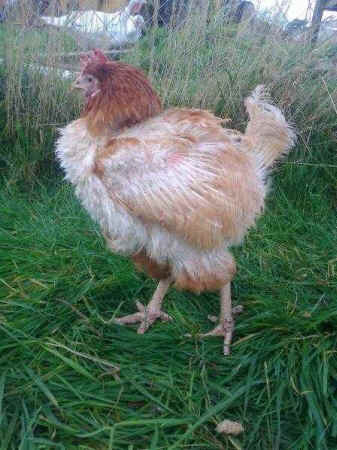 Just one of the rescued hens. They are beginning to run to us when they see us; it is incredible how quickly other animals make friends with members of the species that has caused them so much deprivation and hurt. I imagine that these hens had very little contact with humans prior to being rescued; they were, after all, regarded as production units and not beings. Unfortunately, we cannot undo the damages caused to them by genetic modification by the egg production industry. Nor can we offer them the absolute liberty of the jungle environment they descended from. However, we will ensure that they have a degree of liberty, lots of space, good food, green grass, an area for dustbathing, a comfortable, clean house with private nest boxes and perches, veterinary care when necessary, a lot of love, and every opportunity to find joy in their lives. We would like to take this opportunity to thank those of you who offered us the encouragement, advice, support and financial help that enabled us to have the privilege of offering these girls a home.